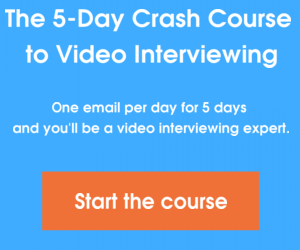 Conducting video interviews during the hiring process has many benefits to your company. It frees up time and enables you to determine which job candidates are worth a second look without meeting them all face-to-face. However, submitting interview questions to applicants undergoing an online job search can be daunting if you don’t know just what to ask. Which job interview questions will unveil the personality, character and work ethic of job candidates via video? 1. Describe a time during your previous work experience when you performed a task outside of your job responsibility. What motivated you to do that task and were you successful? From this video interview question, you’ll not only get an idea of their work ethic and motivation but also their ability to think and act independently. Many employees need coaxing or micro-management, and while you want employees to sometimes wait for your cue, you also want go-getters who see a job that needs to be done and takes action. At the same time, you want to assess whether or not these candidates are making the right decisions, not choices that end up costing your business in the long run. 2. If a heated discussion occurs between co-workers, are you typically the peace maker or decision maker? Why? There isn’t a wrong answer here. Really, you’re just trying to gauge their character. At the same time, you’ll get a sense of how they handle work conflict, which is always best to discover at this point. 3. What do you wish you had more time to do? To get a sense of their personality and what they care about, ask this video interview question. If the answer is online shopping, this is likely a job candidate you want to pass on; they may find lots of “free time” at their new job. However, if their passion is philanthropy or playing sports, you can infer that they are a motivated, caring, team player. Besides wanting to get to know a candidate better, you also want to see how they’ll work with your team as well as within the company. What would your former boss say to us about you? What about your former co-workers? What are your goals professionally and how do you believe they will fit into our goals as a company? Despite the fact that you may not be meeting these candidates face-to-face, there is still a lot you can learn about them from the right video interview questions. What are some other video interview questions you may ask? Share now in our comments!